Please click on the bulleted headings to toggle text. Froelich, Jean Claude. 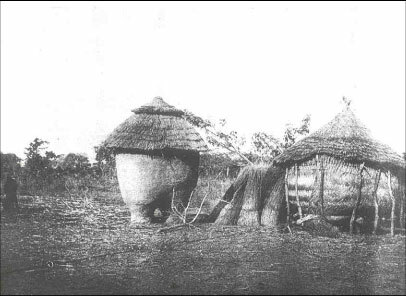 La tribu Konkomba du nord Togo. Dakar, IFAN. 1954. Titles are rough (and sometimes partial) translations from the French. For accuracy please refer to the original. 107 Room interior decorated in black on white. 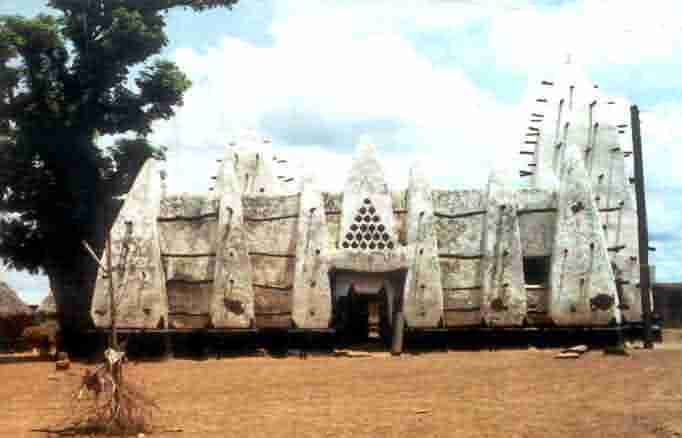 Mosque at Larabanga, reputed to be 600 years old. Bowdich's map of Kumase in 1817. 56 Summoned to the king. Waited a considerable time in one of the outer courts of the palace, which is an immense building of a variety of oblong courts and regular squares, the former with arcades along one side, some of round arches regularly turned, having a skeleton of bamboo, the entablatures exuberantly adorned with bold fan and trellis work of Egyptian character. They have a suit of rooms over them with small windows of wooden lattices of intricate but regular carved work, and some have frames cased with thin gold. The squares have a large apartment on each side, open in front, with two supporting pillars, which breaks the view and gives it the appearance of the proscenium of a stage. They are lofty and regular, and the cornices of a very bold cane work in alto relievo. A drop curtain of curiously plaited cane is suspended in front, and in each we observed chairs and stools embossed in gold and beds of silk with scattered regalia. The most ornamented part of the palace is the residence of the women. The fronts of the apartments are closed (except for two open door ways) by panels of curious open carving, conveying a striking resemblance at first sight to an early Gothic screen. Doors carved in high relief and painted red. Doors chancing to open as we passed surprised us with a glimpse of large apartments. . . the most secret appeared the most adorned. There is always a delay of some minutes, before the door of each of several distant squares is unlocked. Within the inmost square is the council chamber. 57 After a delay of nearly an hour (which seems an indispensable ceremony) in the outer court (where different dignitaries were passing to and fro with their insignia and retinue) we were conducted to a large yard, where the King encircled by a varied profusion of insignia, even more sumptuous than that we had seen before, sat at the end of two long files of counsellors, caboceers and captains; they were seated under their umbrellas, composed of scarlet and yellow cloth, silks, shawls, cottons, and every glaring variety with carved and golden pelicans, panthers, baboons, barrels, crescents etc on the top. The shape generally a dome. Gold canes, spangled elephants tails to brush off the flies, gold headed swords, embossed muskets. 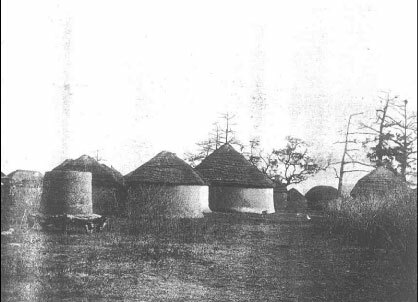 1 Bowdich's book contains a detailed description of the town of Kumasi. 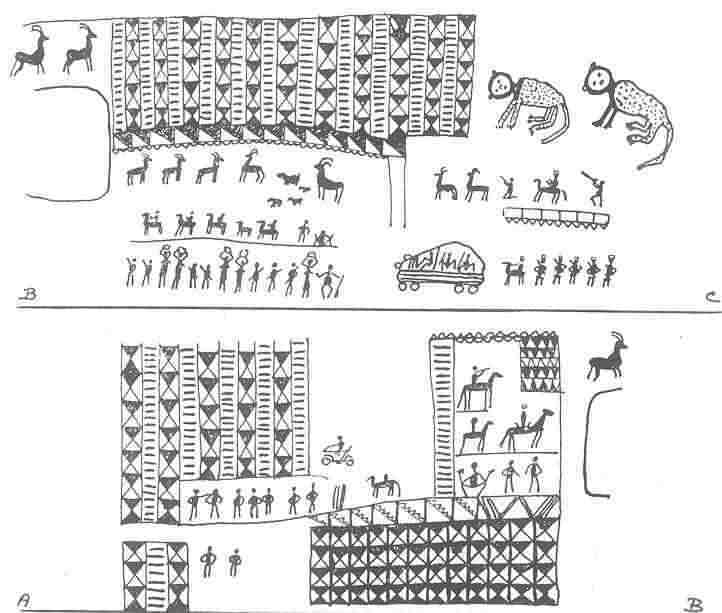 It has drawings of several buildings including the Asantehene's palace. This was situated in the centre of the town fronting an open space, which was used for large ceremonial gatherings. It consisted of a large number of courts surrounded by buildings. 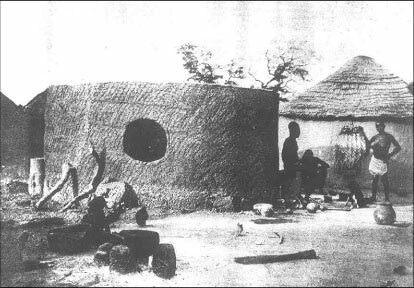 In the main these were constructed of mud plastered on to a timber framework; the external walls were profusely decorated and the roofs were covered with a thatch of palm leaves. The main entrance led from the street into a large court two hundred yards long, which was surrounded by rooms occupied by the Asantehene's captains and attendants. Leading from the large court was a series of courts used for different purposes: some of the most richly decorated were used by the Asantehene's wives. An inner court thirty foot square contained the royal bed-chamber where the King slept on a pile of silk-cotton pillows in an elaborately decorated room; on either side of the entrance, which was hung with curtains of plaited cane, were small windows with carved wooden shutters, the one the left being cased in silver, the right-hand one in gold. The town itself was evidently well laid out, with wide streets planted with shade trees and flanked by houses. The walls of the houses were decorated with mural designs executed in relief, like those of the palace. . . There were four main streets, each about half a mile long and from fifty to one hundred yards wide. . In the nearby suburb of Bantama was the Barem, or Royal Mausoleum. The main building housed, in separate rooms, the coffins of eight Ashanti kings, containing the bones of the royal skeletons articulated with golden wires. . . . It was burnt down by Baden-Powell in 1895 . . .
4 The better houses had internal pit latrines of considerable depth, down which boiling water was poured daily. The yards and streets were swept regularly and all rubbish was burned every morning at the back of the streets. 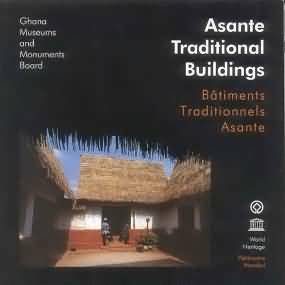 Swithenbank, M, Asante Abakosem: The Traditional Architecture of Ashanti (in Ashanti Research Project, First Conference, May 17- 20, 1963) Inst. of African Studies, Legon.